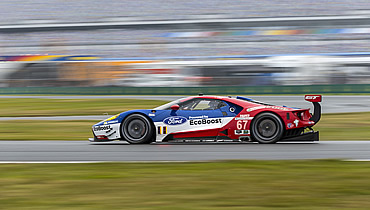 DAYTONA, Fla., Jan. 31, 2016 – The well-known racing adage “there’s no replacement for race conditions” proved true for the two-car Ford Chip Ganassi Racing Ford GT team, who debuted the No. 66 and No. 67 at the Rolex 24 At Daytona after extensive preparation and testing. Both Ford GTs suffered gearbox issues that quickly set them too far behind to catch up. The news was better for the two-car EcoBoost-powered Prototype team until the No. 02 Target/Claritin Riley was sidelined twice with brake problems in the overnight hours. A third brake issue put the No. 02 into the tire wall with just 2 hours, 40 minutes to go with Kyle Larson behind the wheel. Meanwhile, the No. 01 Claritin/Target Riley remained on the lead lap until early Sunday morning until it was sent to the garage for a quick check-up with five hours to go before returning to the track four laps down. “We certainly had our share of reliability issues, and that is not uncommon in a brand new car’s debut,” said Raj Nair, executive vice president, Global Product Development, and chief technical officer, Ford Motor Company. “As we have said, the first time these two particular cars hit the road was literally at the Roar (Before the Rolex 24) test here a couple weeks ago. Aspects of our total testing program had gone very well, so I think we’re a little surprised at some of the reliability issues we have had. As we get into diagnosing the issues, some of them are very specific to what is going on in a race…coming in for a tire change and the wheel hitting a brake line and breaking it. Running three hours under our caution engine calibration (when the car is under yellow flag), and then finding out that is actually causing a problem. We’re still diagnosing some of the stuff that was happening. Maybe even the aspect of the way the in-car TV cameras were wired, which we obviously don’t run during testing, and that may have impacted some of our power feeds and noise in the system. Those kinds of things you aren’t going to find except in a race environment. The No. 01 Claritin/Target Ford EcoBoost Riley was Ford’s highest finisher, at p5 overall. Hartley took the last stint for the 01 team. The No. 02 crossed the stripe with Dixon behind the wheel at p13 overall (p7 in class), while Müller and the No. 66 Ford GT was p31 (p7 in class). Westbrook brought the No. 67 Ford GT to the checkers at p40 (p9 in class). 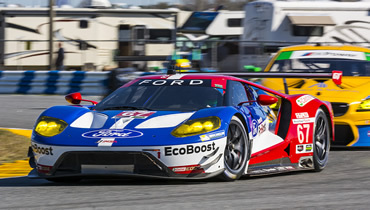 “I don’t think anyone should think of this race as a failure,” said Dave Pericak, Global Director, Ford Performance. “It’s not the Cinderella story we were hoping for, but this is racing. I’d rather work the bugs out now, then later. Our team has been doing an amazing job of staying laser-focused during this race, and not getting discouraged. I can’t even believe how hard they were working. We will re-group, we will fix it, and then we will go out at Sebring and show what we can do. That’s what this is all about.